Papaya Seeds – Is It Safe To Eat Them? Share the post "Papaya Seeds – Is It Safe To Eat Them?" Common names: Papaya is also known as pawpaw and melon tree. Papaya, a tropical plant believed to have originated in southern Mexico and Central America, is now cultivated in tropical and subtropical regions worldwide. C. papaya is cultivated for its edible ripe fruit; its juice is a popular beverage, and its young leaves, shoots, and fruits are cooked as a vegetable. While most people throw papaya seeds away, small amounts of them in the diet are said to be surprisingly good for health. Seeds seem to have more potent medicinal values than the flesh. Papaya seeds have recently caught attention as a potential health food, and while much of the evidence supporting the notion is unverified, the seeds are nontoxic and might be worth trying just in case. – Papaya seeds can eliminate intestinal parasites. – Papaya seeds help detoxify the liver. – Papaya seeds may protect the kidneys from toxin-induced kidney failure. – Papaya seeds have antibacterial properties and are effective against E.coli, Salmonella and Staphylococcus infections. Keep in mind though that chewing papaya seeds is not like eating papaya fruit. They have a strong flavor, more like a cross between mustard and black peppercorns. Like green papaya, the seeds contain high levels of proteolytic enzymes like papain which can help rid your body of parasites. Good levels of digestive enzymes in your diet are also believed to help normalize the environment in your intestinal tract, making it less hospitable to worms and other parasites. The seeds from papaya also contain a unique anthelmintic alkaloid called carpaine that has been shown to be very effective at killing parasitic worms and amoebas. And finally, papaya seeds contain high levels of oleic and palmitic acids. Both are believed to help protect your body against cancer. Papaya seeds are often reported as an effective treatment for liver cirrhosis. One method is to grind up around five dried seeds in a pepper grinder, or crush up fresh ones in a mortar and pestle, and mix them with a tablespoon of fresh lime juice. Drink this papaya seed treatment down twice a day for a month. Many cirrhosis sufferers have had dramatic improvements with this powerful natural remedy. Even for people without such obvious liver damage, a small amount of pawpaw seeds taken regularly is said to help with liver detoxification. The seeds of papaya are believed to have a strong antibacterial and anti-inflammatory effect on digestive system. Studies have shown an extract made from them is effective at killing E coli, Salmonella, Staphylococcus and other dangerous bacterial infections. You can eat papaya seeds by treating them as a supplement and eating them whole, or you could grind the seeds up and use them when you would usually use pepper since the two tastes are fairly similar. You don’t need many seeds at a time. After you scrape them out of a fresh fruit, it’s best to keep them in a sealed container in a fridge if you’re using them regularly, or in the freezer if only occasionally (when kept frozen, papaya seeds can retain their nutritional value for 6 to 12 months). 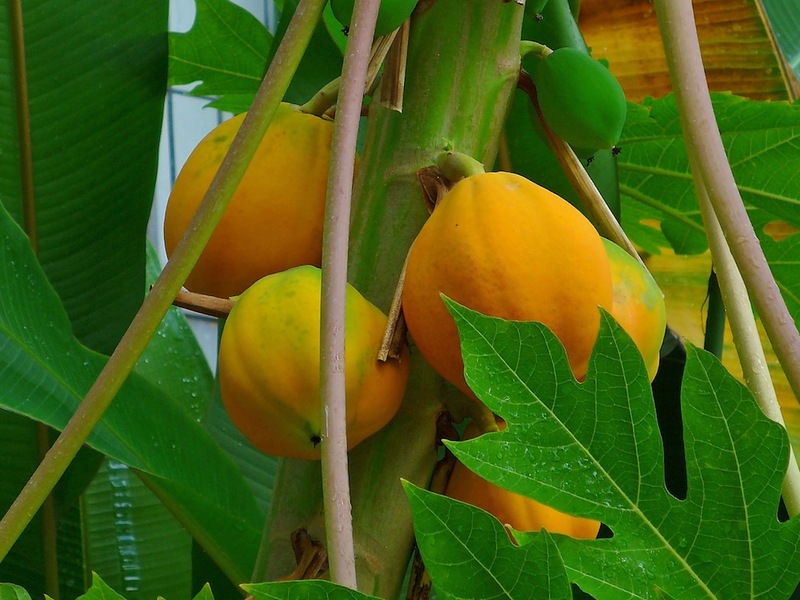 – Get a ripe yellow or orange papaya, depends on the variety. – Cut papaya in half lengthwise. – Remove papaya seeds using a spoon. – Sun or air dry the seeds for powdering/chunks. – Prepare a thick glass or something else for rolling to powder, thick chopping board (wood preferred), and wax paper for easy gathering of papaya seeds. – Powder or break the seeds to chunks by carefully rolling the glass over the seeds. Gather the seeds and store it for use. Best added on your meal, soup and drinks. Smaller papayas tend to have seeds with a milder taste, while the seeds of a large papaya tend to be more bitter. So, better choose a small papaya for a start. Chew directly on a few seeds. Papaya seeds can be eaten whole, but for the first week or so, only chew on one or two papaya seeds a day. Over the second week, gradually work up to 1/4 tsp (1.25 ml), then to 1/2 tsp (2.5 ml), and finally to a full 1 tsp (5 ml) daily. Make things even easier on your digestive system by taking the papaya seeds with a meal heavy in protein. Doing so will make it easier to get the maximum amount of benefits from the proteolytic enzymes in the seeds, thereby improving your digestive health. You can also try eating seeds with 1 tsp (5 ml) of honey. The combination of honey and papaya seeds is thought to be an effective treatment against parasites. Crushed papaya seeds work well as a substitute for black pepper and can be used in equal proportions. According to the WHO, paw paw seeds are also good for alleviating constipation (crush dried seeds, mix with half teaspoon of water). The seeds of pawpaw chew and take with milk is a very good cure for thyphoid fever. Proved and aproved in Nigeria. – and the latex for psoriasis, ringworm, indigestion, or applied externally as an antiseptic or to heal burns or scalds, or applied to the cervix to contract the uterus. Shallow cuts on the surface of fully grown but unripe fruits cause a milky sap or latex to ooze that is collected, dried, and termed “crude papain.” Papain has many industrial uses, as well as milk-clotting (rennet) and protein-digesting properties. Nearly 80% of American beer is treated with papain, which allows the beer to remain clear upon cooling. Papain is most commonly used commercially in meat tenderizers and chewing gums. Cosmetically, papain is used in some toothpastes, shampoos, and facial creams. There is very little data available to make specific recommendations regarding systemic doses of papaya seeds. One study used a 4 g dose of air-dried papaya seeds in 20 ml of honey to treat helminthiasis. While there are many benefits to eating papaya fruit, there are also a few potential papaya enzyme side effects and warnings to be aware of. This is particularly the case with regards to the green unripen fruit, papaya seeds and papain enzyme digestive supplements. Green papaya salad, seeds of papaya, as well as supplements containing papain enzyme are best avoided by pregnant women. This warning does not extend to a fully ripe fresh fruit with no green on it. These papaya fruit contain much lower levels of papain and are generally considered very healthy for pregnant women. 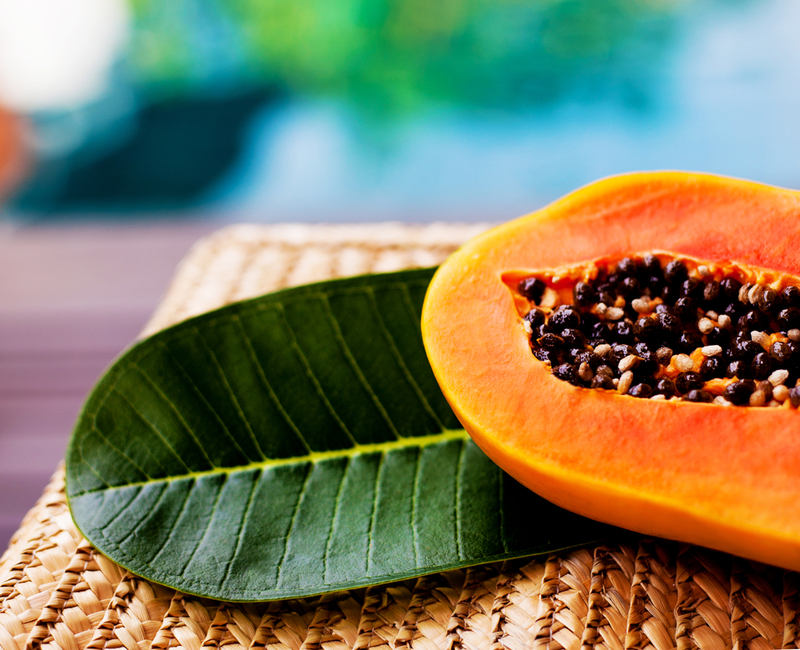 Papaya seeds, green papaya and other potent sources of papaya enzymes may interfere with a woman’s menstrual cycle if taken in large and regular doses. Papain suppresses progesterone, a hormone needed to prepare the uterus for conception and maintain pregnancy. Another possibility is that papain may break down a membrane vital to the development of the fetus. Some sources advise against using papaya enzymes, unripe papaya or even the ripe fruit during breast feeding. Talk to your doctor if you are being treated for a stomach ulcer and are thinking of using papaya enzymes with papain for digestion, as there are mixed reports from health resources regarding papaya enzyme and ulcers. The papain enzyme may increase the blood thinning effects of medications such as Warfarin and other anticoagulants, including daily aspirin taken for this purpose. As such it is not recommended for use at the same time as a course of these drugs. It is best not to take papain for several days before major surgery for the same reason. People with blood clotting disorders, such as thrombosis and hemophilia, are also advised to avoid papain and green papaya. Papaya and especially the green fruit high in enzymes should be avoided by anyone with a latex allergy. Papaya allergies are rare, but people who experience allergic reactions to papaw may also have an adverse reaction to pineapples, avocados, bananas, figs, kiwi fruit, melons and possibly other tropical fruit as well and should use any of these with caution and watch for symptoms. There are parts of the plant (eg, seeds) that contain benzyl isothiocyanate, which may cause poisoning at high doses.